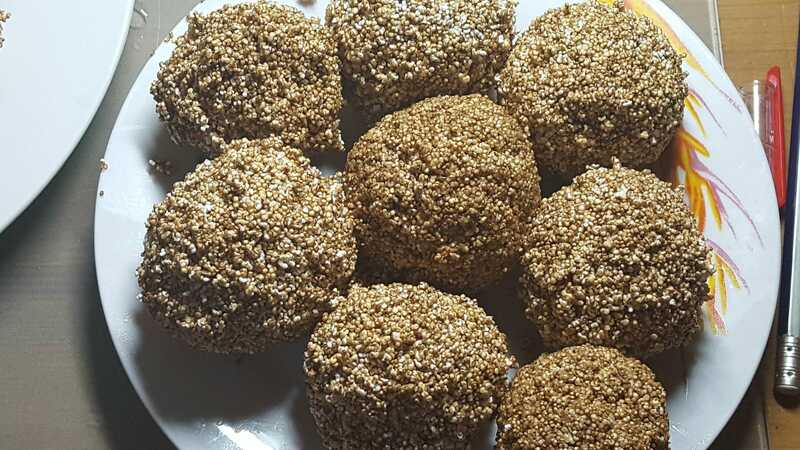 Rajgira ladoos are very easy and healthy.These ladoos made with puffed rajgira seeds.Rajgira or Ramdana as it is popularly known in Northern India is a powerhouse of nutrients.Rajgira is a good source of calcium, protein, and magnesium. Rajgira is gluten-free grain also.These ladoos were usually made by my mother during winter and during any fast like Shivaratri, Navratri, Janmashtami etc. Start with roasting 1tsp of rajgira at a time in a sufficiently hot heavy based pan(kadai). Keep stirring continuously until they puff up well. After all rajgira seeds roasted then sieve it, and keep puffed rajgira in a big deep bowl. Use the same pan for jaggery syrup, heat ghee and put crumbled jaggery as jaggery starts to melt cook it for 5-6 minutes then mix puffed Rajgira. Wet your palms with water and start to make ladoos. Place them on a plate after one hour stored in an airtight box.